I can't remember the year specifically, but circa 1985 my parents bought me a Yamaha QT50 Yamahopper moped. 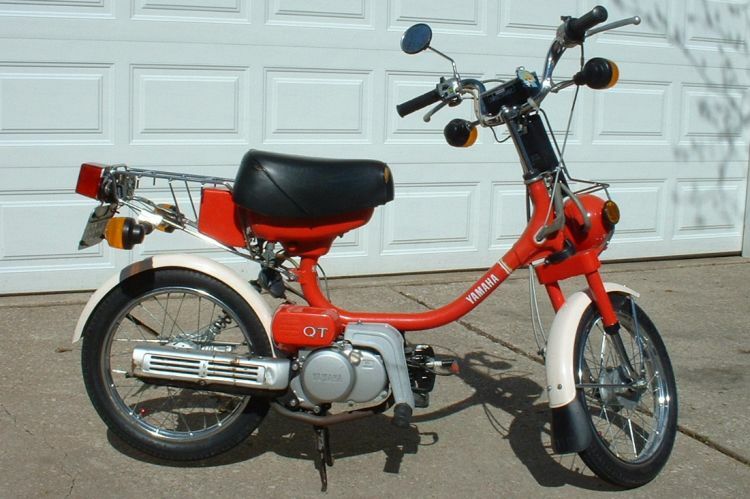 These were interesting in the fact that they were two-stroke 50cc engines, but the Ohio legislature didn't consider it a moped because it didn't have pedals. 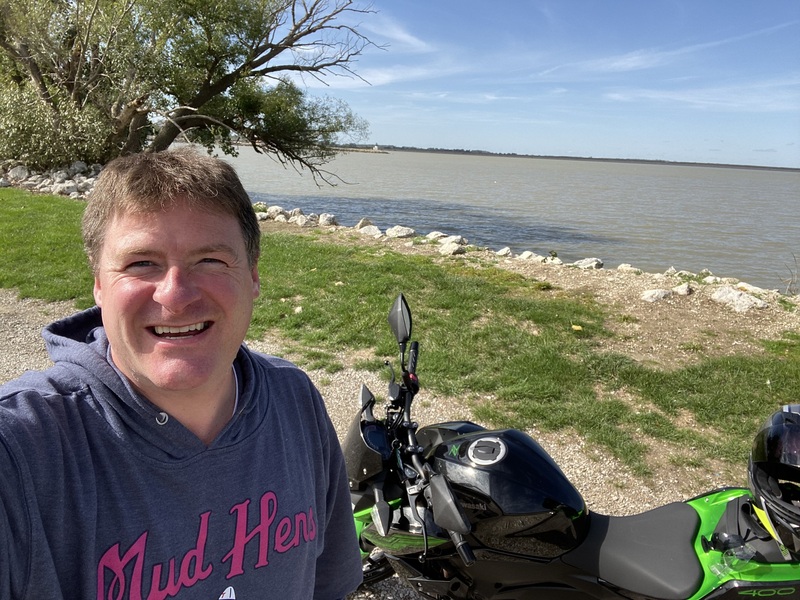 I wasn't old enough to get my street legal motorcycle temps, so I was only able to ride it around the 5 acre property we had. (And the occasional sneaking it up and down the street.) It got close to about 45 miles per hour according to the analog speedometer it had (but I'm not sure I trust that - it was probably more like 38mph). That was pretty good for me. Eventually, I mastered jumping it over dirt mounds and locking up the back brakes and having a good time with it. It came to its demise when I took one last jump and the handle bar stem cracked at the front fork tube. That was it. I couldn't extract the long bolt holding it all together. It was dead. I tried reserecting it, but it just wasn't worth the time or energy. Life took over until 2019 when I decided as part of my mid-life crisis (Hah!) to take the Ohio Motorcycle Written Test and take the Motorcycle Safety Foundation Beginner Riders course. For anybody interested (regardless of age), I highly recommend this rather than having your buddy teach you or learn on your own and try to pass the DMV test. You're gonna learn a lot about different bikes (if you haven't chosen one you like yet), you will also learn to handle manuvers (life saving) such as high speed swerves, emergency braking, and in my case riding in nasty weather (35 degrees, torrential rain, and over 40 mile per hour winds) in April - not fun, but the classes usually sell out for the entire year by March. So you take what you can get! The class runs rain or shine - no exceptions! You really learn to trust the machine you're riding, the traction of tires, etc. A couple of tips - bring water and snacks - there are several 10 or 20 minute breaks while they change the course up for the next lesson. Another tip is do what I did - I watched people get on Honda Rebel's, Susuki TU250's and struggle the entire weekend with the longer front end. Not me, I took the Yamaha TW200. 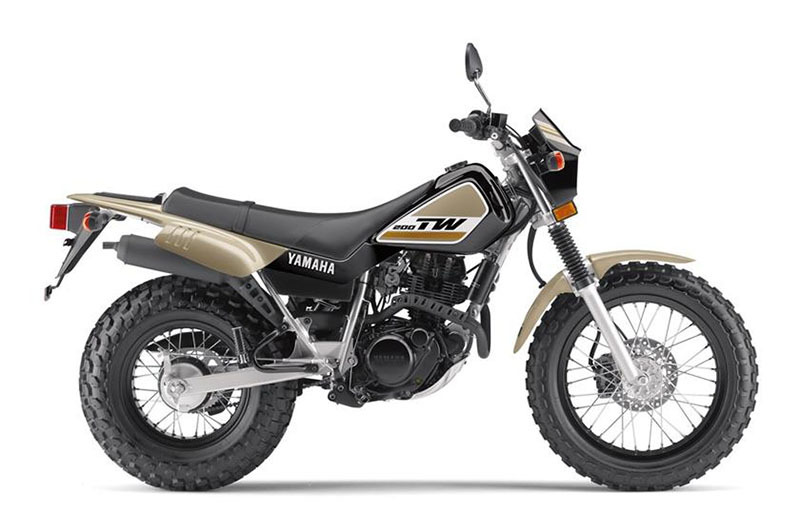 Looked, acted, and sounded like the old Yamaha Enduro dirt bikes. Made it a lot more fun - like I was on a dirt track! Anyway, I've always loved Yamaha's stuff, but I always liked the Kawasaki Ninja line also. I figured, you only live once (especially if you ride motorcycles), so time to get back and start riding again. I wasn't getting a 1000cc roadster or anything and I'd just kill myself on a supped up Ninja 1000...I'm not on the racetrack anyway. I kinda liked the look of standard sport/naked bikes as they are called. I was looking at the Kawasaki Z650, but got a good deal on a 2019 Kawasaki Z400 (pictured below). Figured it's more fun to drive fast on a slow bike, then drive slow on a fast bike. The Z400 will do over 120mph and pull a wheelie with me on it - not that I'm going to admit I did any of those two illegal acts on public roads! My only dream is that people stop driving like idiots and watch what the hell they are doing when they are driving. You'd be amazed at the people looking down at their cellphones, not paying attention at intersections, etc. It's like Brooks says in Shawshank Redemption..."The world went and got itself in a big damn hurry.". It's kinda sad we can't take time to just relax, settle down and enjoy life.